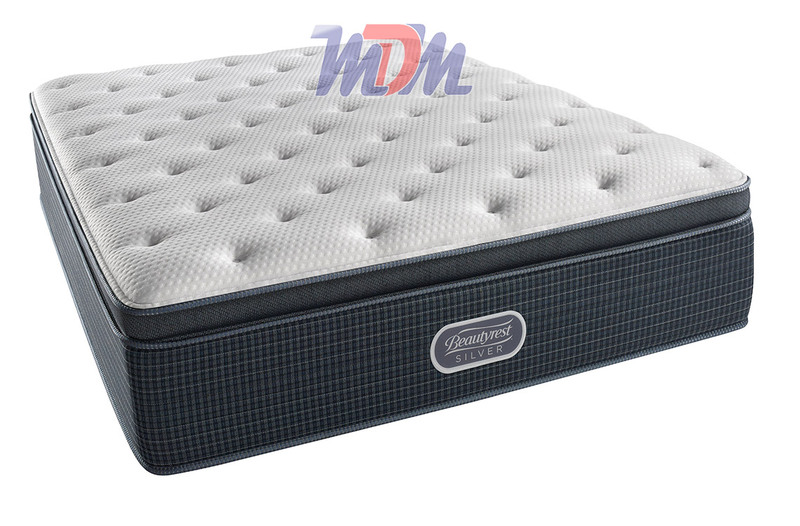 The "Offshore Mist Pillow Top Plush" mattress by Simmons Beautyrest is the ultimate combination of plush feel and long-lasting supportiveness. It's brand-new for 2017; an update on the very popular Q Palm Plush Pillow Top. The iconic designers at Simmons kept the same construction and features as the last model and improved the look, for this one. "If it ain't broke, don't fix it!". Highlighting the support system is the 800 Density Pocketed Coil inner spring system and the QuantumLock support edge. In addition to these two great features, the Offshore Mist boasts 1 1/4" AirFeel Foam, 1" of AirCool Foam and 1/2" of GelTouch Foam - all assiting in not only luxurious comfort but also in a cooler sleeping surface. The "Recharge: Silver" line offers all of the latest technology, at the most competitive price point in the industry. The BeautyRest Palm Plush Pillow Top was one of our customers' favorite mattresses; when they were looking for something with a reliable and patented support system and a truly luxurious plush feel. 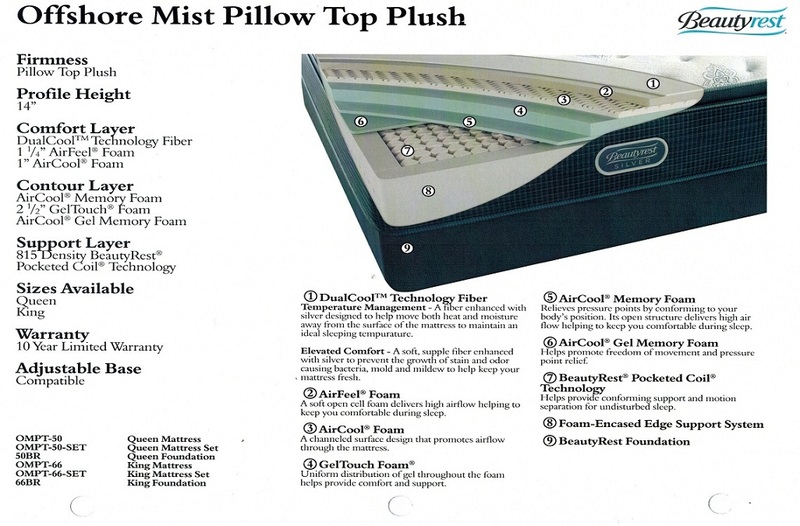 Well, that model has been updated - with a sleeker-looking cover and more appropriate name: The "Offshore Mist Pillow Top Plush". Anyone who enters our sales floor in search of a "soft-but-supportive" mattress tries the Recharge Offshore Mist Pillow Top Plush and is instantly impressed with the loftiness - and density - of the pillow top. The QuantumLock Edge Support nearly eliminates all motion transfer and 'sway' that comes from someone entering or exiting the bed. AirCool and AirFeel foams help to dissipate heat from this luxury sleeping surface. The 800 Density Pocketed Coils provide just the right combination of body contouring comfort and lower-gauge metal, for a longer-lasting comfort. 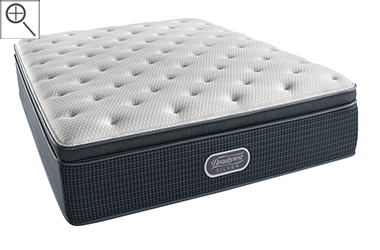 This is a highly recommended model for sleep-seekers who prefer a softer bed. With the Silver Recharge Series, durability is not sacrificed for comfort. At a medium price-point, one couldn't ask for anything more; this mattress's features are usually reserved for much higher-dollar models! A great value and a great night's rest.